No Chemicals for My Baby! I have always been a cautious person in regards to products I use in my house and on my body. I am even cautious with the products I use with my dog (he is family after all!). As a parent now, it is my job to make sure that I research and use the best possible products on my daughter. By best possible products I don’t mean more expensive or most popular, but the best natural products possible and the least harmful. Many parents are drawn to products because of name and reputation of well-known products, opposed to what is in these products. Just because it is on the shelf at the store, it still doesn’t make it safe! It is important to do your own research and not rely on advertisements or claims. 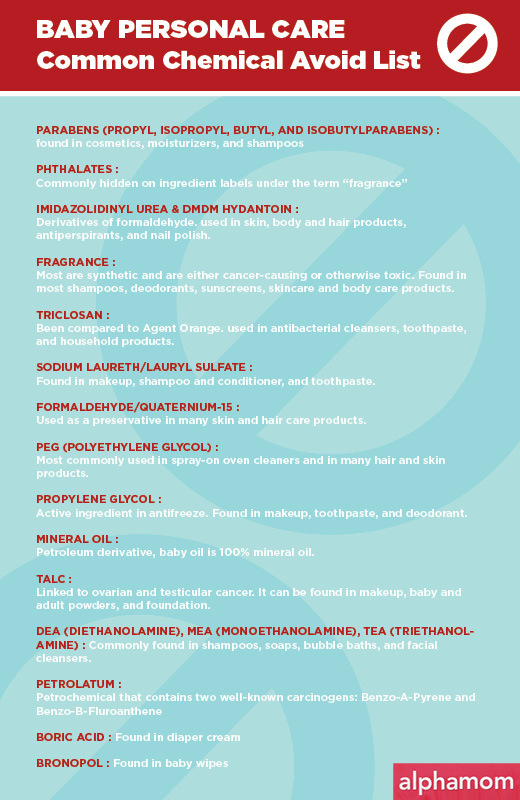 Below is a cheat sheet of the commonly found chemicals in children’s personal care products, courtesy of Alpha Mom. Share it with other moms, print it out, and keep it in your wallet for easy access while shopping for products for you and your family!